Welcome to my pink and sweet world! This is my online diary, some kind of resource site too. This site is open to anyone in the blogging world, know how to tag and im open for new friends. Click it for me everyday. ? Friends and visitors, fellow bloggers, please visit my new subdomain, i won't be active in my blogspot account anymore. Visit my new link. http://sweet.bubble-puff.org/ thanks! I've done lots of requests now, i just don't know if they like it. if so, thanks. if no, okay. i'm good. btw, i think i'm moving on my new subdomain. but it is not yet ready for the pub so i guess i will be redirecting all my friends here on my new subdomain. the sub's about my life with my mom Jazzy and the other cyber families on robocity. i am so excited about this. Got to go now, byebye. I was bothered last night and last following nights about this. I'm not sure if i will let it go. . I just don't know what to do. You kno, it isn't bad to say ily to a person you really love, i like saying it first in the morning, and then i'll send him an im telling him that i really love him, and it doesn't matter if he loves me or not. The fact is, i don't know. Is it that i'm confused or just giving it a meaning, cause he's still concern and you kno you feel something inside and it says he still loves you. It's quite hard to decide on anything cause i don't kno the real catch?! And i don't what's my status, he won't tell. and if he says it, it may not be true. But i asked him last time on what's the real situation he says i'm like a friend to him. isn't it funny while on the other side he was jealous and he was the one to send me an im everytime i open my offline messages. I want to see him again, and talk of things we should be talking about. Clarification is what i need. or do i have to really let it go? I just watched a movie entitled Albino Farm. I find it thrilling, cause i'm used to different monsters or any weird creatures in any movie. I like the setting, meant loved the setting. The story starts on 4 college students heading to albino farm, i don't know the real reason cause i skipped that part cause my friend called. so they were on a ghost town like a suburb something like that, some houses lights are lit off and the streets are free from many cars. i like how it is set. heh. and it ended up on heading them on the Albino Farm. Then after that they started to run for their loves cause there were cannibals living in that place, the Albino Farm is a condemned place. they tried to fight for theirselves but unfortunately one girl survived. She turned crazy after that. You might want to watch it?? Just a little fact about Albino Farm. The story of the movie was based on the true story. there is really an albino farm located on Ozarks, missouri? i can't remember and it is formerly known as Springlawn Farm. some says that it was a laboratory before making experiments on albinos. 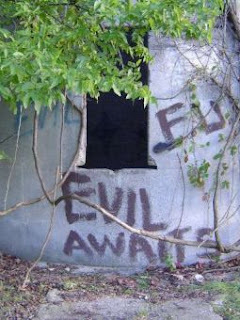 others said that there was a caretaker on it scaring and haunting trespassers. ahh. i wish i could go there at night, and see what if feels like. The rest of the legend is here: Underground Ozarks gee, i really love deserted towns in the west!! A perfect place to explore! I forgot i made a gift for my friends who is helping me on retroghost by clicking the button on my sidebar, in return here's a gift. hope you like it. lovv yaa all. mmuaa. while i was making my new sets of smilies, i came across a lot of blogs, mostly in pink colors, but, something caught me with miss-angel's blog. click here for her link. it is entitled 9 words women use. i find it interesting and somehow can relate to it although i always say K instead of fine, my boy always says that. he's more like of a girl when he's mad. i also say Whatever! if im totally mad at him. But he's fun, he can also dig me up, and he says i also did. aww, i guess i should be working now. soo yun ♥. New layout and another set of smileys! Finally! I made my own skin, it took a lot of days for me to make and design this one. it's really hard when you have lost your inspiration somewhere. i maybe able to design new skins again when im not busy, of course with household chores. heh! this is my layout, just showing it, all materials came from cyworld. ugh, this was a tiring day.. i guess i have to end it here. A new set of smileys! download these smileys on my contents tab. i hope you like it. :) btw, im planning on visiting resources sites and fellow blogspot users but i don't have the energy on this, im feeling sleepy... and oh, this is just a temporary layout, don't worry to ms. corsage, i didn't removed the credits space. im talking too much, i hope can make more tomorrow. im not sure, im going to school and check if i have any failing grades on my swimming class. goodnyt everyone! The display icon says it all. Im a little girl named Soo-Yun (??). Love strawberries, and pink. Rainbow colors. I am 16 turning 17 this november. it's happy to be back again and meet new friends online. What else? I don't talk too much. I love making smileys, blogskins, anything to become more productive. I am also learning about flash and learn more on php. i wish i should've taken I.T. Anyways, I'm friendly, ugh, i need to list adjectives for you to know the real me. you don't have to, if you just want to. That's how i describe it. heh! You can still talk to me on my tagboard. im super friendly, just don't give me an attitude, you can ask whatever you want, we can talk of things. im always open, and talkative. I love your blogskin!! Can i copy your basecodes? I'll promise i'll credit you!! Yes, you can copy and credit. You can alter the codes too. Be sure you are a friend before doing that. Can i request a skin? 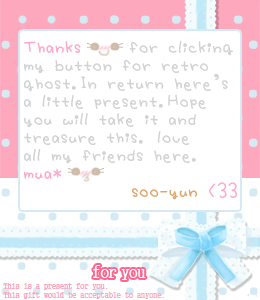 Of course you can, send an email at chocosooyun@gmail.com. :) it is also stated in the sidebar. Just include your preferences like colors, background images, images for headers, and any other details important for making skins. Most of my images come from Cyworld, Glitter-graphics and Deviantart. You are amazing on stuffs, can you teach me? Sure thing! If i have the time, i would love to teach you on making blogskins. My fonts are from Technicolor-dreams.org. The SDKwangSoo font. And the rest and system fonts. Where do you get your creations? Mostly comes from the heart, and the one that inspires me, often. :D I just don't make a skin, i make all with love. What program do you use for making your contents? I use Adobe Photoshop CS4 and Adobe Illustrator CS3. If you have any questions, raise it on the tagboard. 25 October - 28 October . ♥ Download♥ Preview 08. Today is..
?Download ♥ Preview 09. I love cake! Welcome to my resource site!